This is a hand-engraved sterling silver pin-pendant combination with a'Turtle' design by Pacific Northwest Native jeweler Justin Rivard. This playful piece measures 1 1/2" x 1 1/4" and is signed on the back. The turtle totem symbolizes our peaceful walk on this earth. It represents the path we take as we embark on our journey through life. In contrast to emotional or spiritual development occurring in bursts, the way of the turtle anchors our personal unfolding in a slow, more grounded series of steps and longer cycles of transformation. In addition to being trained artistically as a carver, Justin is a trained jeweler. He is dedicated to applying his skills to new and unconventional forms, while using the same media of gold, silver and semi-precious stones. For example, Justin has created carved business card holders, lighter covers, and cufflinks. Justin trained with Kwakwaka'wakw artist Ray Dumont for 16 years and has work in Canadian, American and Scottish galleries. Keywords: "turtle totem", "Haida pin", "Haida brooch", "tortoise pendant", "pacific northwest indians". 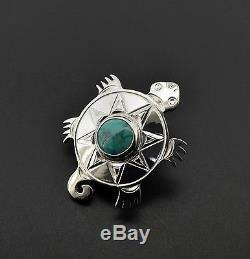 The item "Native American Turtle Pendant Brooch with Turquoise Northwest Coast Tortoise" is in sale since Tuesday, September 23, 2014. This item is in the category "Jewelry & Watches\Ethnic, Regional & Tribal\Native American\Necklaces & Pendants". The seller is "artfromabove" and is located in Vancouver, British Columbia. This item can be shipped to North, South, or Latin America, all countries in Europe, Japan, Australia.